The Shimano PD-A530 Pedal has a platform on one side and an SPD clipless engagement mechanism on the other—perfect for your do-it-all bike. Adjustable SPD tension and sealed cartridge bearings. Uses a standard SPD cleat (included). Silver or black. 383 grams. 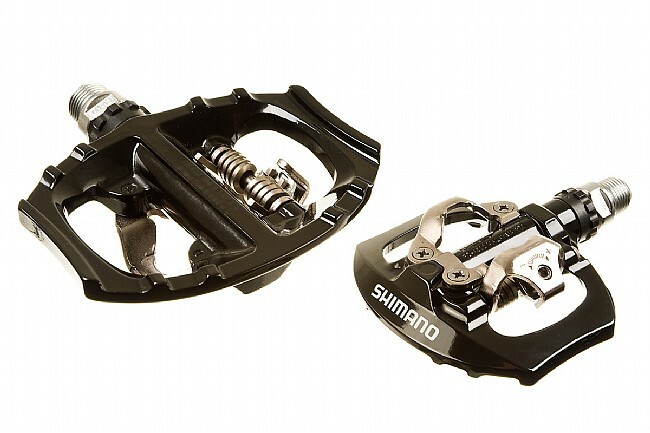 I've tried quite a few different brands and models of this style pedals, which are my favorite for commuting and touring bikes. Some of them broke within a couple years, but I've had a set of these A530's going on 6 years now on my main commuter and they're still good as new. Picked up another set for a newer bike, and quality seems just as excellent as the old ones. I've owned these for years and recently gave a pair as a gift to a friend. Just right for many riding conditions and rider skill. Well-made and pretty light as well. Provides a good platform for short rides without cleats or quick starts at lights. Cleat side spin up from stops ok, normally within a rotation. This is a great double sided pedal for urban use. Especially when you just want to jump on your bike in your street shoes and go for a quick ride. I put these on my daughter's bike. She typically rides clipless in the summer and platforms in the winter with studded tires on our icy roads and trails, or occasionally platforms with casual shoes. These save me a few minutes of pedal changeover a few times per year. I originally bought them for my commute bike, and I'll probably order a second set soon. Great reliable pedal. Exactly what I needed for my daily commute and weekend rides. Great reliable pedal. Easily adaptable to how I'd like to ride on any particular day whether commuting or longer ridesraces. Im buying my second set. Lovin' these things. They are well made and I use them daily for commuting - option to clip in or out is great. They work well. I like that I can ride with regular sneakers, but also do longer training rides with bike shoes. Good looking and functional. Can hop on my bike with or without cleats. I purchased these for winter riding, the platform side is slippery, especially when wet, and you will be toe flipping to find the side you want. Crank Brothers cleat system is superior but their design is not compatible with a dual use pedal. No grade inflation here - a solid C. Needs design refinement but this is a small market niche so it probably won't happen. I am a triathlete who MTB for overall bike handling skills and cross training. I put a pair of these on my Felt nine60. These provide you with great versatility and solid Shimano mid level performance. SPD's cleats stay on and tight but snap out sharply as needed. Good & reliable, not the lightest set of pedals out there but I was not looking nor needing that. Well constructed and seem pretty tough. The regular shoe side is sufficient for aggressive pedaling or just cruising round with friends or family. Very convenient. I have MTB raced and just plained cruised with my kids and never had to worry about what shoes I was wearing. They also come in black, which is the color I chose purely for aesthetics. This is my first use of clipless pedals. Easy to clip into and release. Flipping the pedal over for the clip or platform side is easy. No problems whether you're wearing bike shoes or sneakers. And the pedal is light weight too. I use it on my Tern folder. It's great to have both the platform for regular shoes and the SPD side for cleated shoes. Both are easily reached, they hang vertically so you kick forward with clipless shoes and back with regular ones. In Portland, it's a good idea to replace the grease with Phil's Waterproof, just to make them last longer. You do need the Shimano tool to take them apart, but it's only $3. I received and installed the pedals. Good quality that I expect from Shimano, and easy to install. They are perfectly suited to how that bike is used-sometimes with cleated shoes and sometimes with flat shoes for commuting and errands. The usual Western Bikeworks fast delivery was a plus, and the price was substantially less than in my local bike shop. Nice size non-cleat side. bigger than some other multi-purpose pedals. Very utilitarian.,efficient when used as clipless, and convient, when used as a platform. 90% of time used as clipless, commuting over flat terrain and urban bridges of New York City. Occassionaly a quick juant or arron in street shoes or sneakers is very convient and practical. These are very well made pedals and light for what they are. The SPD side is flawless, easy to clip into and stable. The platform side is not so good though, they're slippery and your feet tend to eventually slide off sideways if your footwear has hard or flat soles. In sticky running shoes, they're fine. The slipping seems to be because of the shape of the lugs, they're large and have rounded edges, and the front rails are smooth all the way across. So you don't have sharp surfaces to dig into and hold your soles or to give good feedback as to where your feet are on the pedals. In fact, surprisingly, there's very little feel at all on the platform side, so I wind up looking down a lot to be sure my feet are at least sort of centered.